I was recently introduced to pilpel dips during our Melbourne Cup lunch at work. Having coeliac and gluten and dairy intolerant employees always makes these kind of work functions a challenge, however we always manage to have an amazing spread of food. Our Melbourne Cup lunch was no different with bread (gluten free and glutenous), crackers, antipasto items including sundried tomatoes, ham, salami and olives, prawns and a selection of pilpel dips. pilpel dips are all gluten and dairy free simply because the chef believes that you shouldn’t add anything to food that’s not essential to the flavour. At our lunch we had the hummous, beetroot almond and baba hummous dips. All of the dips were fantastic however my favourites were the baba hummous and beetroot almond. The baba hummous dip is smoked eggplant with creamy hummous and considering I love anything eggplant it was bound to be a winner. It was full of flavour and was good enough to eat on a plain cracker or piece of bread with nothing else (e.g. cheese or sundried tomatoes) needed. I actually preferred having the dip just with a plain cracker so that you could experience the full flavour of the dip. The beetroot almond dip has a tang to it and at first I couldn’t work out what this was, but after reading the ingredients I recognised the hot english mustard flavour. This is a great variation on the traditional beetroot dip. The hummous was also very good, quite different from other hummous’ I have tried as it was very smooth and creamy. We purchased the dips at the Chatswood Chase Coles but if you want to know where to buy them in your area you can find out here. What is your favourite dip flavour and brand? 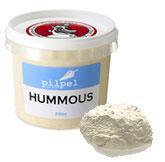 PilPel hummus is one of the best around! Look out for their other brand Darikay, they make soups and curries, gf too!